Wontons in spicy chilli oil. An International Incident Party. This month’s International Incident Party is a hot one. And I literally mean “hot”. It’s Sichuan Cuisine. I can’t handle too much spiciness in my food but don’t mind a little, just to get my tongue tingling. I don’t know much about Sichuan Cooking so I had to do a bit of googling. You can get a good background of information here. Our lovely host of our monthly party, Penny will not join us this month. She was home in Singapore after receiving some sad news. Our prayers and thoughts are with her and her family. 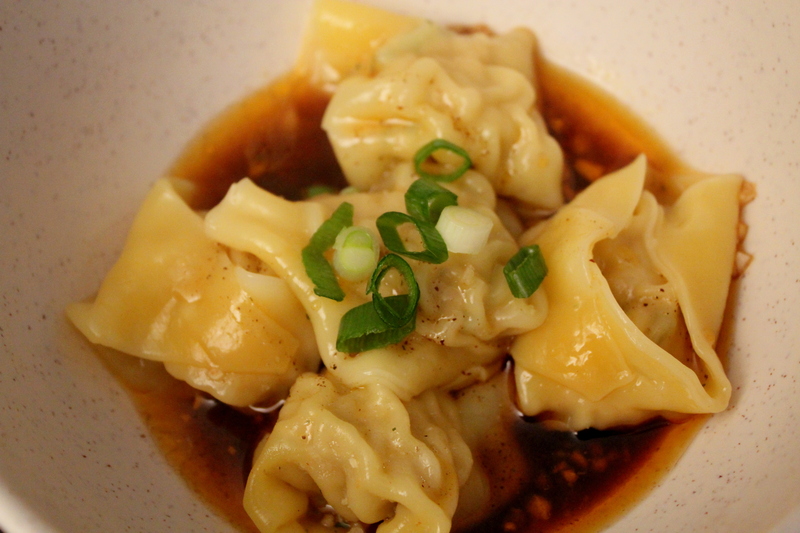 The dish I decided to make for this month’s theme is wontons in spicy chilli oil. 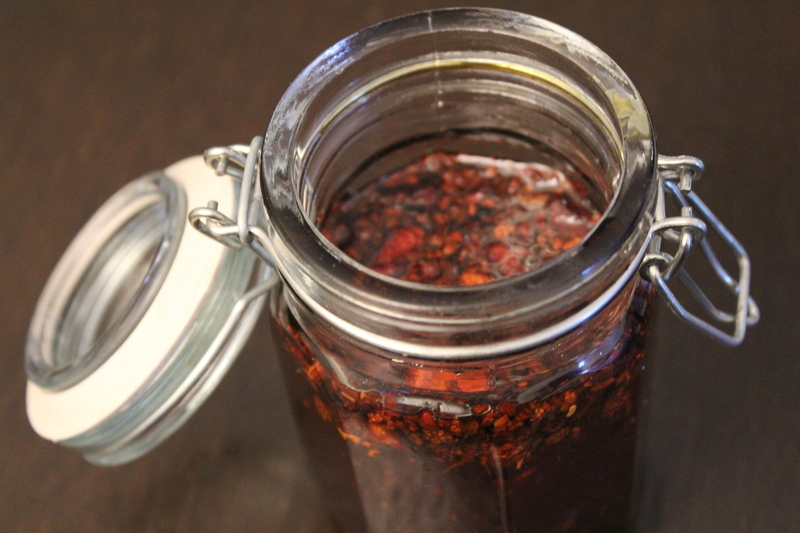 The chilli oil is new to me and I was excited when I was making it. I knew I wouldn’t be able to handle the heat and the spiciness of all the chillies I put in it but since Hubby can handle more heat than me, I gave it a whirl. I found different recipes on the net for both the dumplings and the chilli oil. I combined a few together to come up with my own. I found a recipe that left the chillies in the oil and called them toasty bits. I did the same as I think it keeps the chilli favour in the oil. And if you so inclined, you may also use the toasty bits in your dishes for extra heat. The oil keeps well. I poured some sieved oil into a squeezy bottle ready for use for that extra zing in Hubby’s dishes. I also poured the rest of the oil, toasty bits and all, into a jar with a tight fitting lid. I am familiar are making wontons but I’m not so good in the wrapping department. Any uncooked dumplings can be frozen in the freezer. When you are ready to eat, cook from frozen. To make the dish child (or mummy) friendly, I simply made my own pork stock using some roasted pork bones I found deep within my chest freezer. I added the wontons and also some noodles. Two dishes in one. To make the chilli oil, pour the oil into a small saucepan and add all the chillies. Bring to the boil. As soon as it boils, turn down the heat so it just bubbles gently. Keep on eye on the oil as you do not want to burn the chillies. Keep on low heat for about 15-20 minutes. Leave to cool, then sieve into a squeezy bottle or pour into a jar. Store the jar in a dark cool place or if you’re not using everyday, store in refrigerator. To make the wonton fillings, place minced pork in a large work bowl and use your hands to stir in the rest of the ingredients except the wonton wrapper. Keep mixing till the mixture is a little sticky but light in texture. If you have time, you can leave in the refrigerator for one hour. 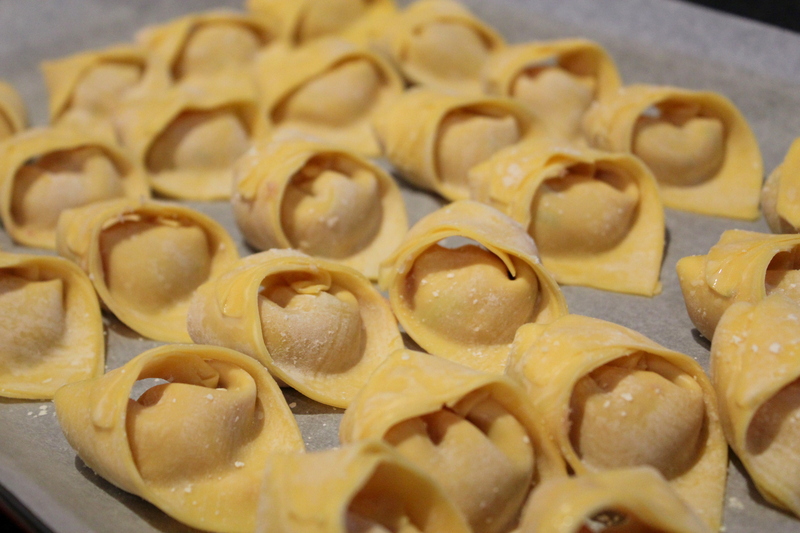 To wrap the wontons, place 1 tsp of the mixture in the middle of the wrapper. With your finger, wet two sides other wrapper with water and fold over to make a triangle. Wet one bottom corner and fold over to the other bottom corner, using your finger as a guide. It should be like a ring on your finger. Press tightly to seal. Repeat till all your mixture is finished. To cook the wontons, you drop small handfuls into boiling water. Stir gently a little so they do not stick together. Leave to simmer gently for about 10 minutes or until cooked. Remove with a slotted spoon. You can also cook in stock for an instant meal for the children. 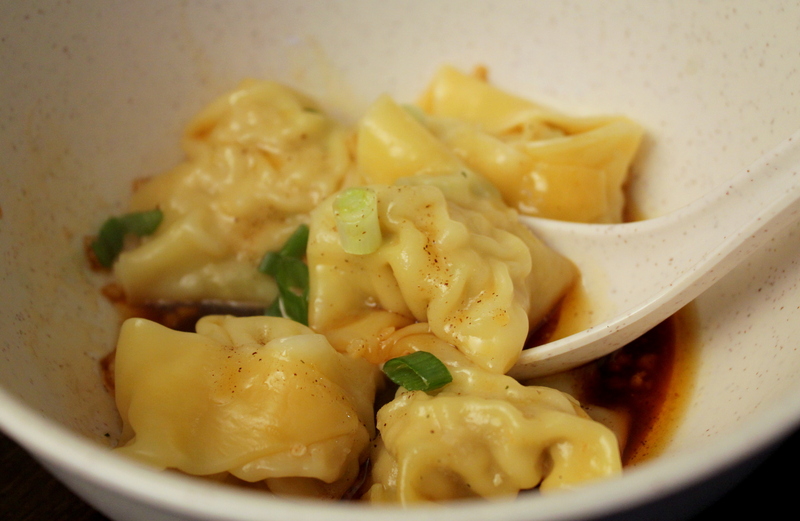 Place the cooked wontons over the sauce. You can drizzle more chilli oil over, if you like. Garnish with more sliced spring onions. 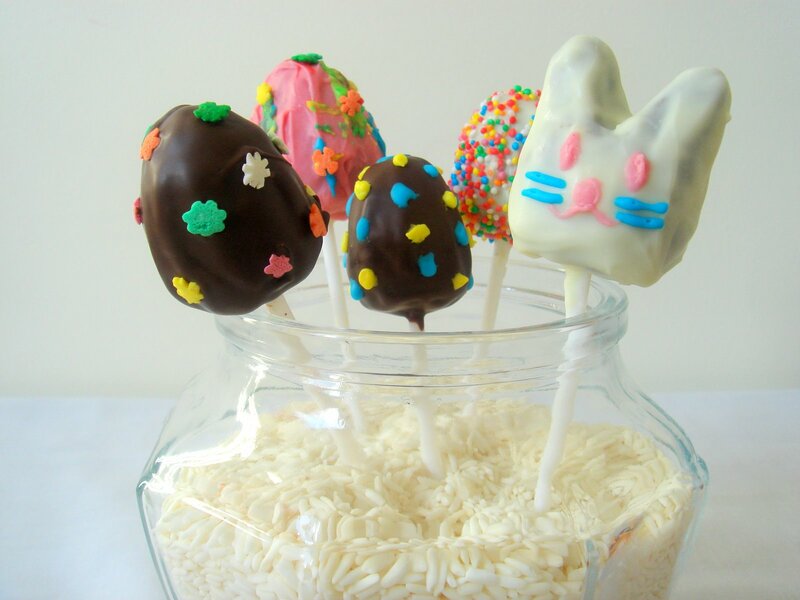 Easter Chocolate and Dulce de leche Cake Pops. An International Incident Party. I’ve been looking forward to this month’s International Incident Party. As always, it’s hosted by the lovely Penny from the Jeroxie blog. This month’s theme is Cake pops. Some might say that they are the new cupcakes. They’re cute, they’re cool and they’re fun and easy to make. 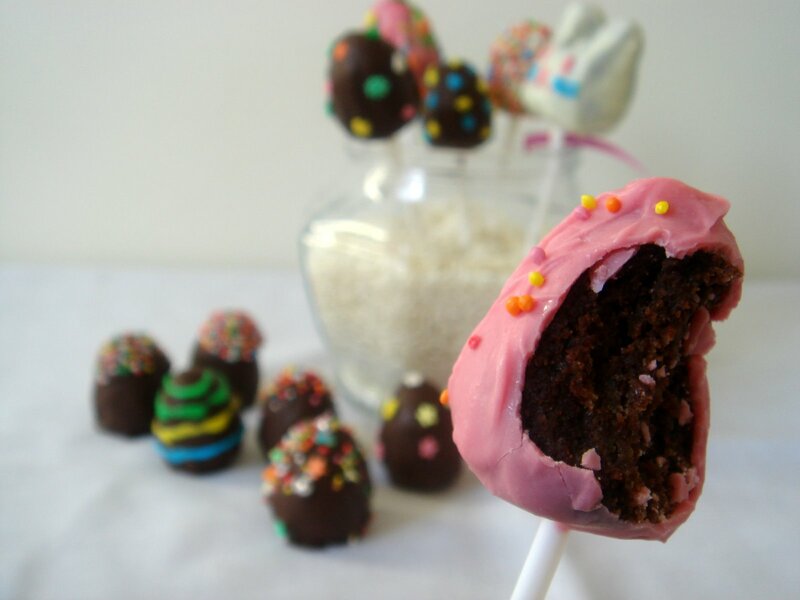 I’ve made cake balls before but have never made pops. Bakerella is known worldwide for this little ball of sweetness. You can see her demonstrate on how to make them here. There may be many steps to create these little cakes but it is actually quite easy to make. 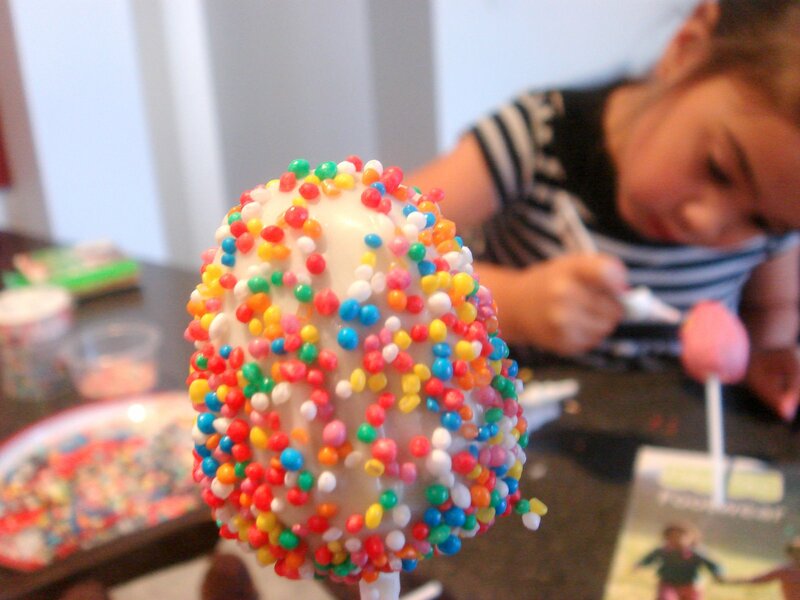 I wanted to make Easter Cake pops and I got my daughter to help decorate them. It’s a great kitchen project for children. They can get really creative. 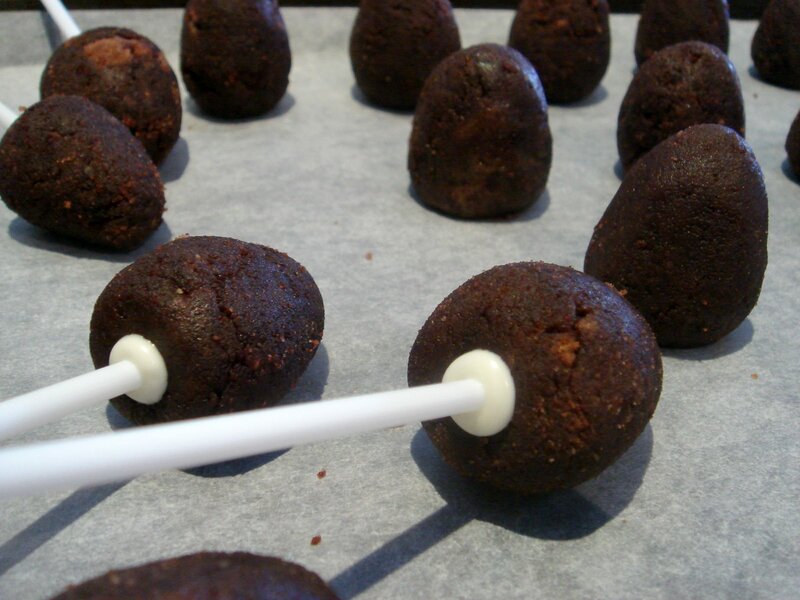 You don’t have to freshly bake a cake just to make cake pops (though you can, of course) but you can use left over cake trimmings. Just freeze any left over cake (no icing) in the freezer. It can keep for a few months. When needed just defrost in the fridge. I had left over devil’s food cake from when I made my Christmas cake balls. Instead of using the usual cheese cream frosting, I used a can of dulce de leche. I make these from cans of condense milk. You can get recipe here. 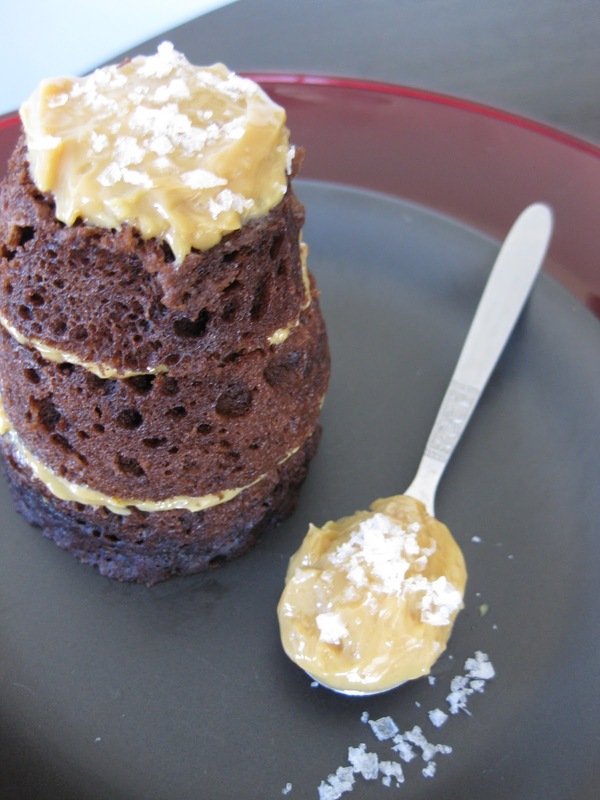 The dulce de leche makes it luscious and sweet, just the way Hubby and my children like it. You don’t have to make balls, you can make any shape you like. I experimented and made little bunnies too. 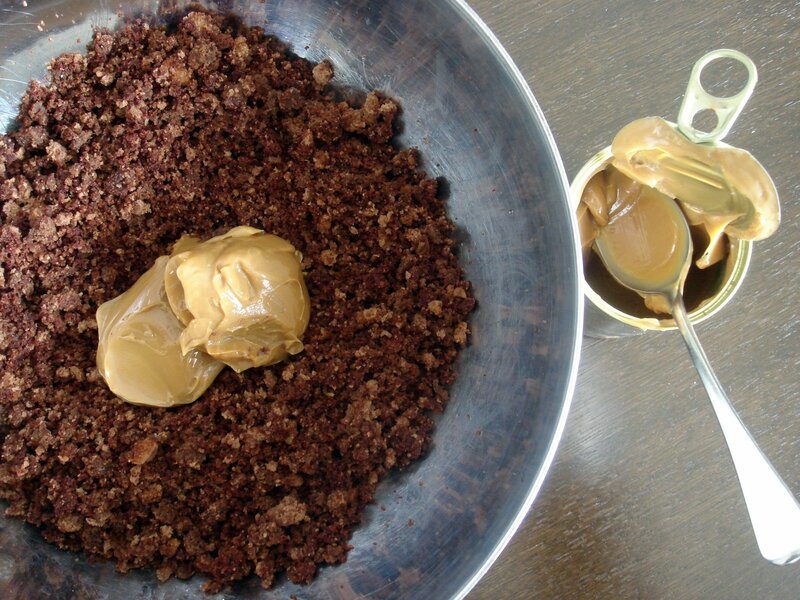 Crumble the cake until until it resembles bread crumbs. Add about a third of a can of dulce de leche and mix thoroughly until the mixture is moist enough to make balls. Don’t add too much dulce de leche or the mixture becomes too sticky and hard to shape. Take a heaped tablespoon of the mixture and roll in the palm of your hands. Shape the balls into eggs and place on baking paper on a tray. Place in the refrigerator for about an hour to harden a little. Melt chocolate in a bowl over barely simmering water until shiny and smooth. Take a lollipop stick and dip about 1cm of it into the chocolate. Insert the stick about half way into the cake pop. Let it set for a minute. 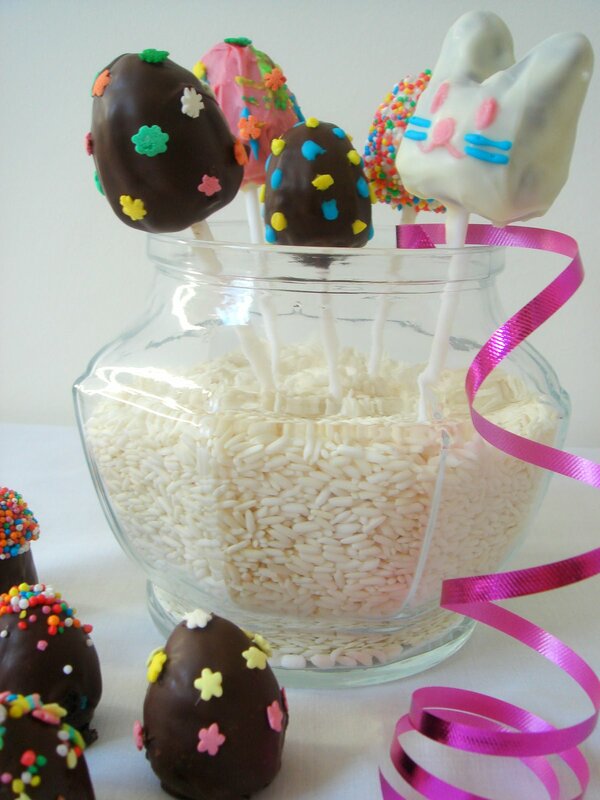 Dip the cake pop into the chocolate and cover the whole cake. Don’t move it around too much as you might lose some crumbs into the chocolate or the cake might come off the stick. You can decorate straight away with sprinkles or any lollies or you can let the chocolate harden and then decorate with liquid gel pens. 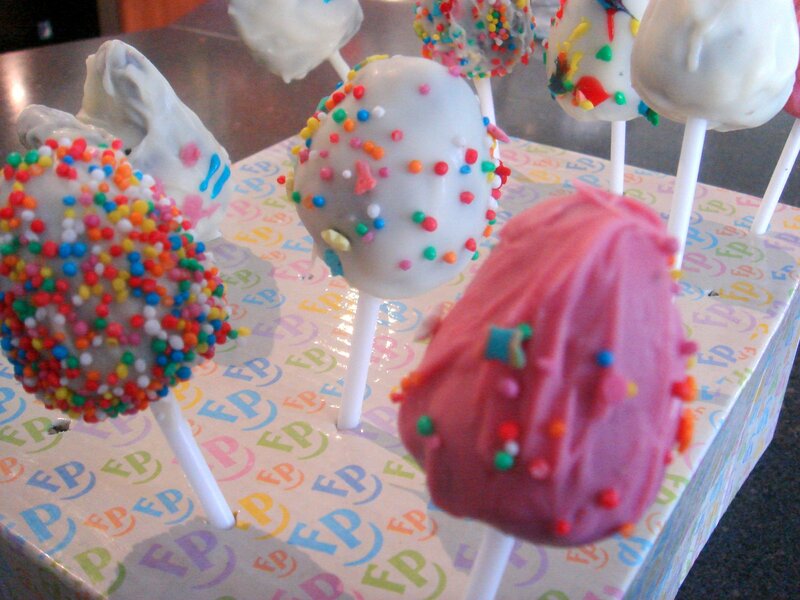 Dry the cake pops by sticking them into styrofoam. Or you can do what I did and stuck it in a box that I made little holes in. Deanna and I enjoyed decorating these. We spent the whole afternoon do this so it gave a great opportunity to have mummy-daughter time. When you make this, make them with children. If you don’t have any, borrow someone else’s. Another month, another International Incident Party hosted by Penny. No matter how busy I am, I always look forward to this time of month when I challenge myself with whatever theme has come our way. This month’s theme is Nostalgia. Food always conjures memories of people and places. I grew up in a typical Filipino family home in Melbourne so every meal almost involved rice. Occasionally, we would have a roast on a Sunday and we would call it “Australian” food. Back then, as a child, I didn’t appreciate how my parents tried to keep us in touch with our heritage through food. As an adult, I crave these dishes and snacks and every bite brings back memories. Growing up, even though my mum and dad would cook up delicious Filipino dishes for our daily meals, it was hard to get our hands on snacks and Filipino delicacies. There were no Filipino grocery stores like there is today. (even though only a handful). We would wait for one for our friends to holiday back to the Philippines and bring back lots of goodies. Nowadays, Australian customs are strict and bringing delicious goodies back in is very hard. One snack that I would love to receive was cornick. Cornick (also known as corn nut) is a popular corn snack and can be made with adobo, chilli or garlic flavour. You can get commercial ones but the best ones are home made and sold in local stores or on the side of the street. I wanted to make this but this was definitely a challenge as I had no idea on how to do so. And to be honest, it wasn’t a complete success but it wasn’t a complete failure also. The process seemed easy but I wasn’t sure if it will work. Some of the corn kernels popped but the texture was still fine. The successful kernels that didn’t pop tasted and felt like the real deal. I made garlic salt to serve with it. As this involves hot oil and deep frying, please be careful. If you have an outside kitchen, it’s probably best to make this outside. The kernels can also be roasted. Maybe I’ll try that next time. Take corn kernels, (I used popping corn) and soak in water for 3 days. Change water and rinse out the kernels every day. On the third day, dry the kernels. Make sure you dry them well because everyone knows, water and hot oil do not mix. In a large pot with a lid, add vegetable oil, about 2-3cm deep. On a low medium heat, oil temperature about 120-130degC, throw in a handful of the kernels and let it fry. Place the lid on top just in case the kernels pop. The aim is to try to fy the kernels without popping. If the oil is too hot, they will pop, so please keep an eye on the temperature. Only do a handful at a time with the lid on. If they do pop, which mine did, wait till the popping stops before removing the lid. If you find that they are popping straight away when you put them in the oil, turn the heat down or turn off straight away. Fry the kernels for about 3-5 minutes and drain on paper towels. Serve with garlic salt. For the garlic salt, I simply gently fried whole cloves in the oil until golden. I added it to the salt and smashed it with a fork and mixed to combine. If you would like to join us for our next party, check out our forum. Check out what other party goers made for the party. This month you are all invited to our Sundae International Incident Party and as always, it’s hosted by the lovely Penny from Jeroxie Blog. I love ice cream, and who doesn’t, right? For this month’s theme, I was dreaming up all sorts of combinations and concoctions. I was feeling ambitious. However, as usual, time got the better of me and so I needed to do something quick and easy. 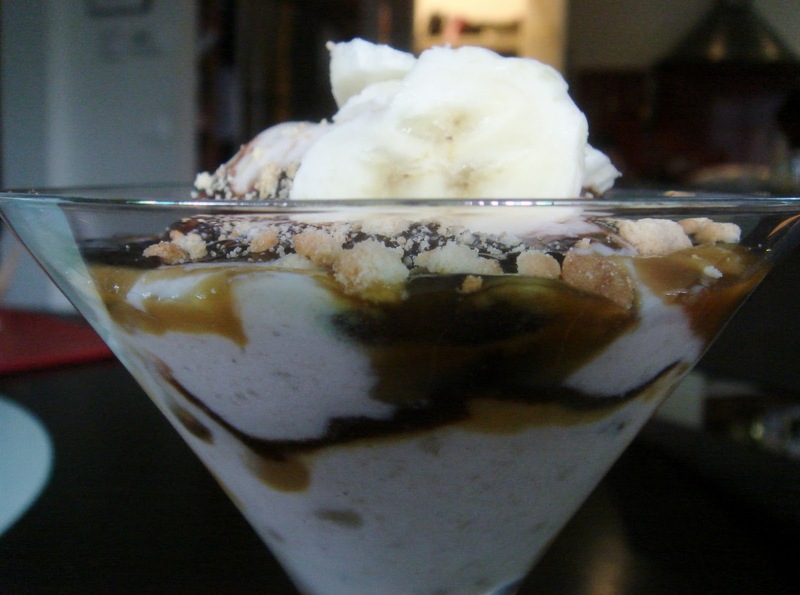 For my contribution this month’s theme I made a Banoffee Sundae. A banoffee pie is an English dessert containing bananas, toffee and cream in a pastry or biscuit base. This makes for a great combination for a sundae. 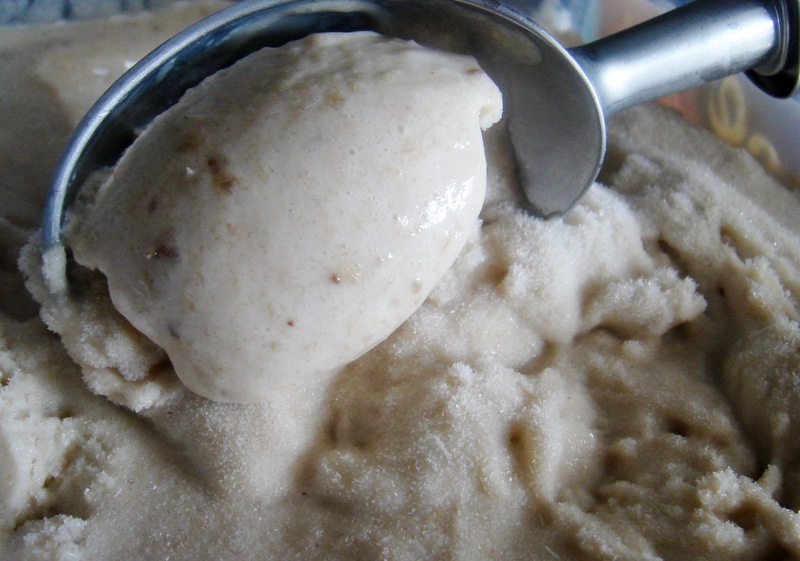 I don’t have an ice cream maker but after some research and brain storming, I came up with a way to make a delicious no-churn banana ice cream. It’s very easy and it only uses 3 ingredients. It freezes well. Just remember to take the ice cream out of the freezer 30 minutes before you want to eat it so it softens a little. 1. Peel and chop the bananas. Place in a snap lock bag and freeze over night. 3. In a food processor, place the frozen bananas, condensed milk and cream. Whiz till the ingredients are well combined and the bananas have been pureed. 4. Pour into a container and place in the freezer. Stir the mixture every hour for 2-3 hours. Freeze for at least 4-5 hours or even better, overnight. Place all the ingredients in a saucepan, bring to the boil and simmer for 5 mins. Place all the ingredients in a saucepan and stir over a gentle heat until the mixture is melted and smooth. Let it cook for 2-3 minutes. 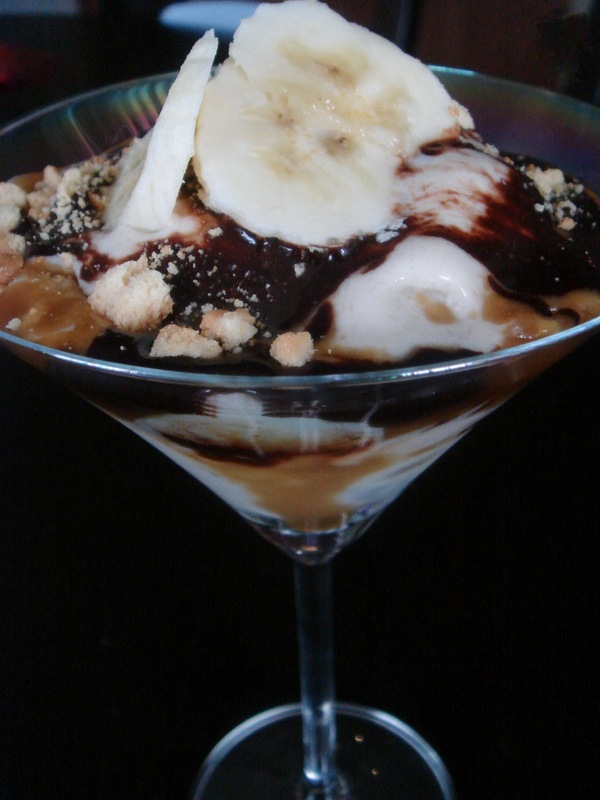 In a bowl or dish, place 2-3 balls of the banana ice cream. 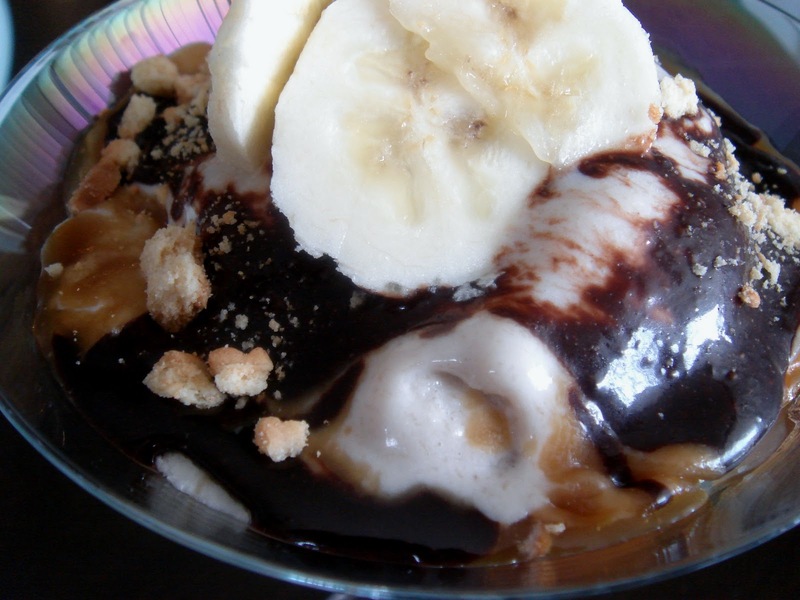 Drizzle the butterscotch sauce and the hot fudge sauce all over ice crea. Sprinkle the crushed up biscuits. Garnish with slices of fresh banana. Go and check out what everyone else brought to the party by clicking below or by going to our forum. 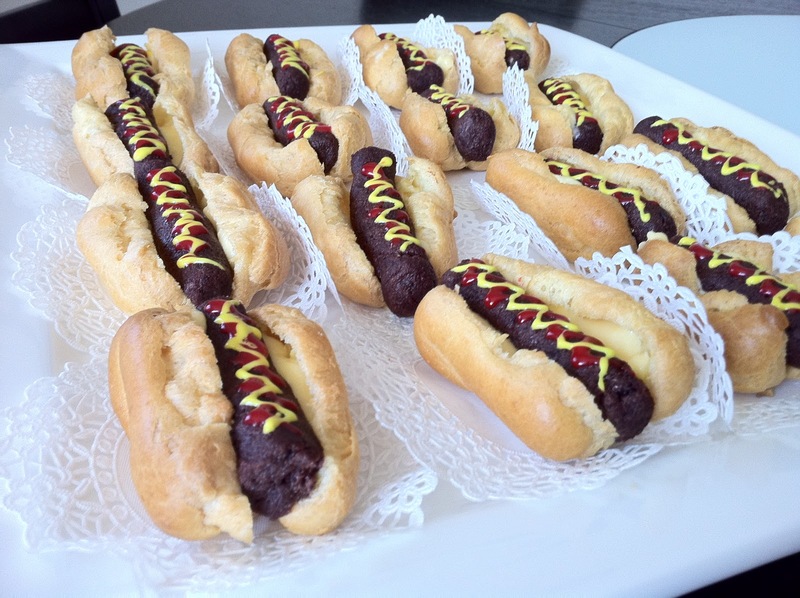 Hot Dog Cakes. An International Incident. So this is our first International Incident Party for 2011 and I’m pretty excited. This month’s theme is Hot dog. Penny from Jeroxie Blog, is again hosting this great monthly event. If you would like to join, please visit our forum. 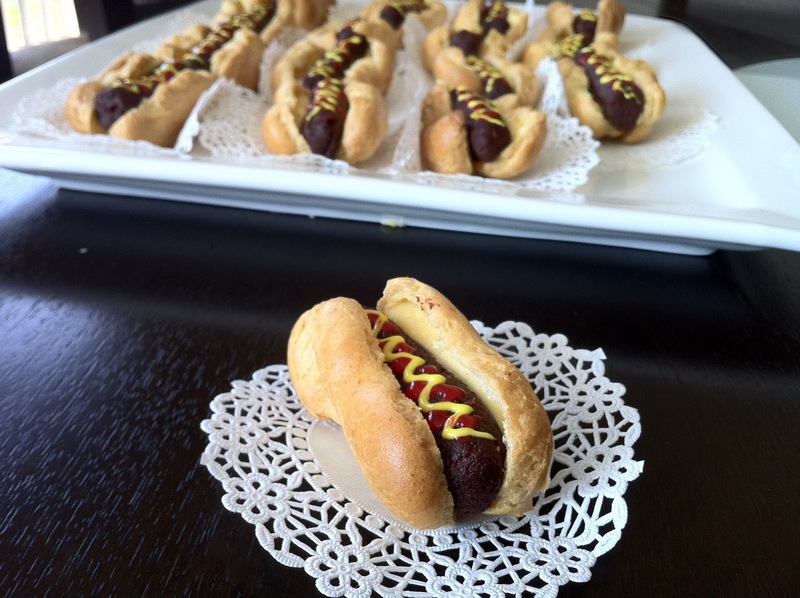 I’ve had this vision to create a cake that looks like a hot dog after making my hamburger cupcakes. I thought that this was the perfect opportunity. This also ticks off another challenge I set myself that I will conquer all dishes that have intimidated me. 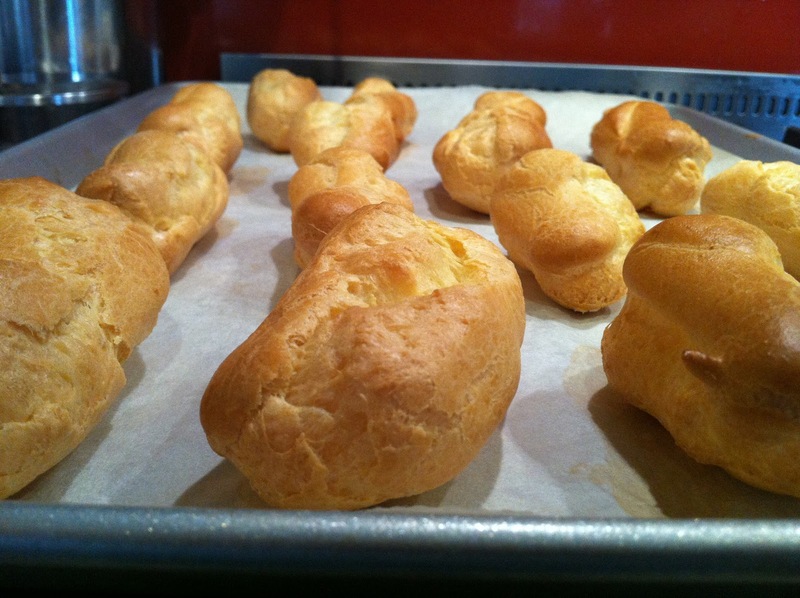 I have always been afraid of making choux pastries. I love to eat it, Yes. But to make it, I have been too afraid to just think about it. I don’t know why I was so afraid of it. I was quite easy, actually. 1. Preheat oven to 180degC (160 fan forced). Grease and line two deep 18cm round cake pans. 2. Beat the butter and sugar until light and fluffy. Beat in eggs, one at a time. 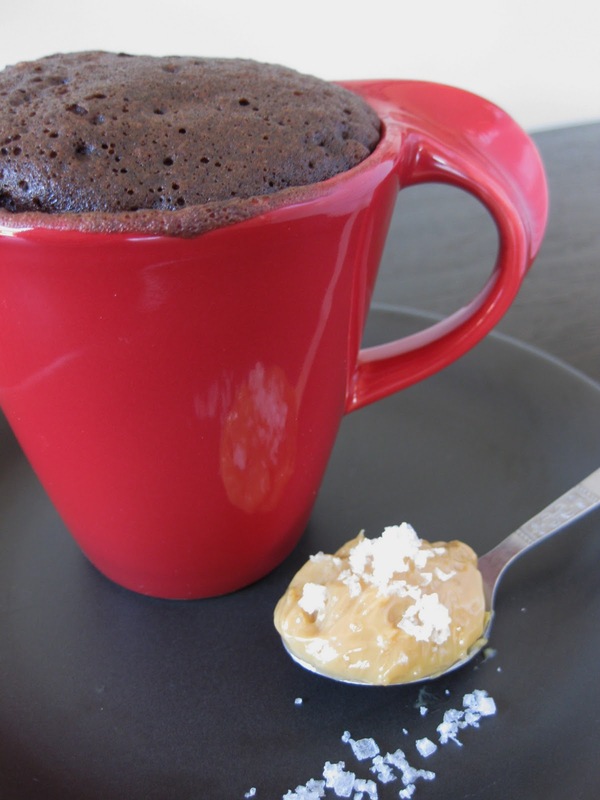 Fold in sifted flours, soda, cocoa and coffee. Combine the colouring, water and milk and pour into dry ingredients. 3. Bake about 25-30mins. Turn cakes out onto racks to cool completely. Beat the cream cheese and butter in a small bowl until as white as possible. Gradually beat in sifted icing sugar. To make the sausages, crumb one of the cakes and add the cream cheese frosting. Mix thorough till well combined. Take about 1 heaped tablespoon and shape like a sausage. Let it sit in refrigerator for an hour to set. 1. Preheat oven to 220degC (200 Fan forced). Prepare two oven trays. 2. Combine butter with the water in a saucepan and bring to the boil. Add flour and beat with a wooden spoon over the heat until the mixture comes away from the sides of pan and forms a ball. 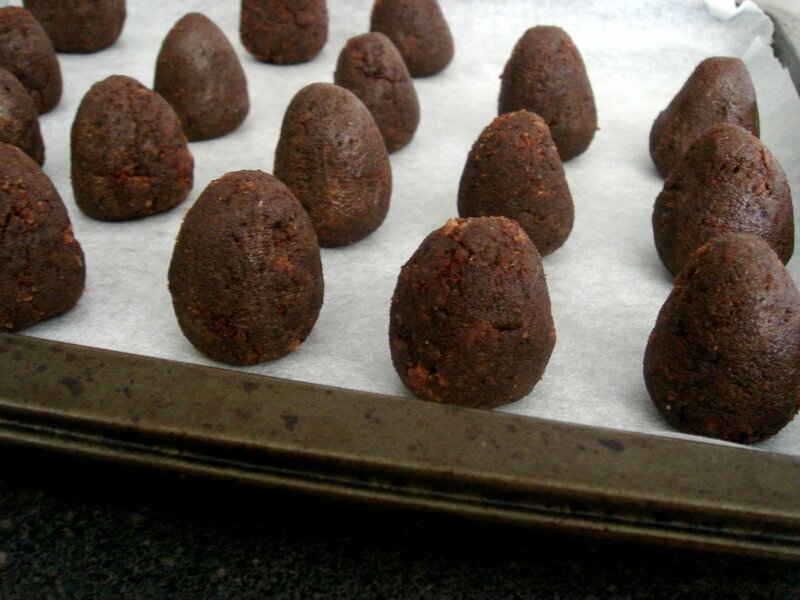 Transfer to a small bowl and the beat in the egg with a electric mixer until it becomes glossy. 3. Spoon the mixture into a piping bag fitted with 1cm plain tube. Pipe 10cm lengths of the mixture 3cm apart on to the trays. Bake for 12 mins. Reduce the temperature to 180degC (160 fan forced) and bake another 10 mins or until they are browned lightly and crisp. Carefully cut the “buns” in half and remove any soft center. 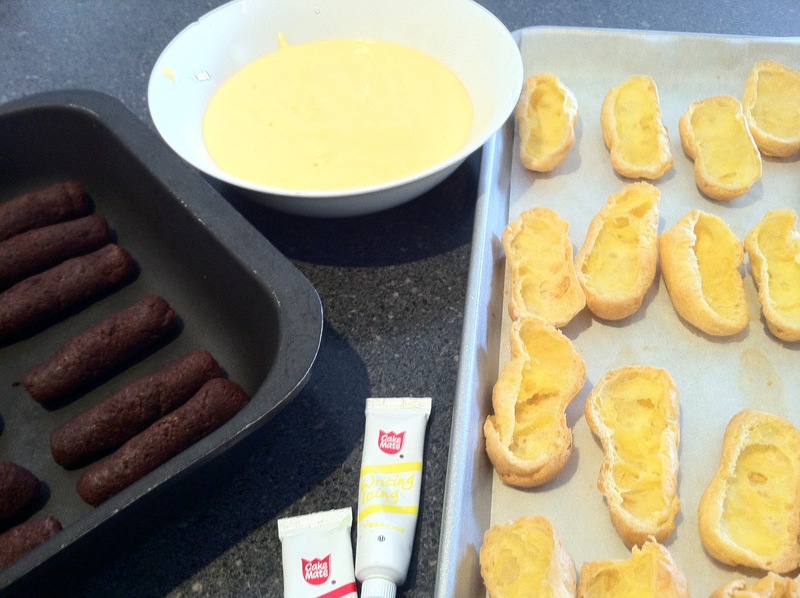 Bake for another 5 mins or until eclairs are dried out. Leave to cool. 1. Bring milk & vanilla bean to the boil in small saucepan. 3. Meanwhile, beat egg yolks, sugar & cornflour in small bowl with electric mixer until thick. 4. With motor operating, gradually bet in hot milk mixture. 5. Return custard mixture to saucepan; stir over heat until mixture boils & thickens. 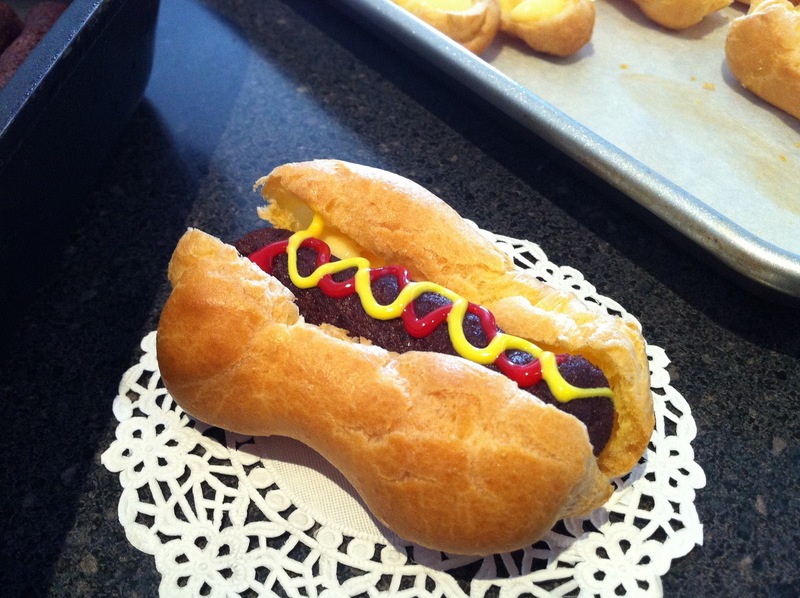 To assemble the hot dog, pipe the pastry cream into both halves of the choux pastry. 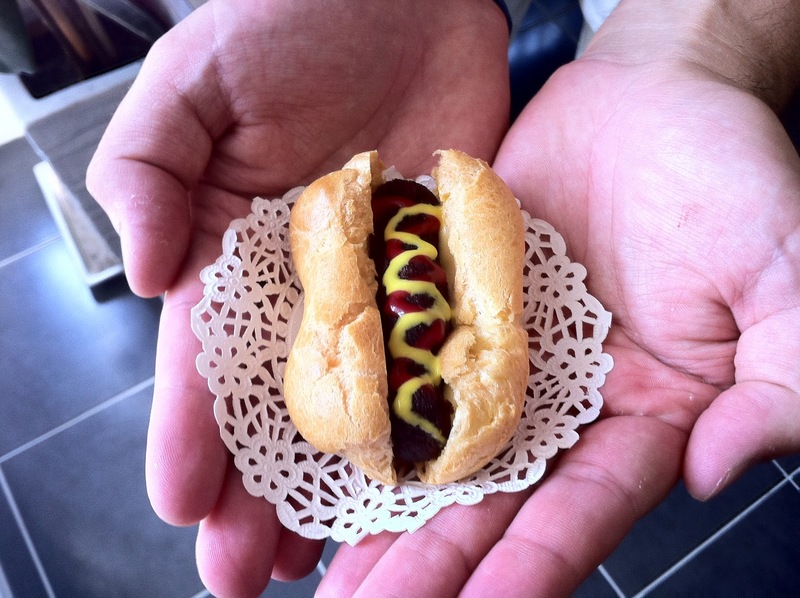 Take the sausage and sandwich in between the choux pastry buns. For the ketchup and mustard, I used red and yellow writing gel. Colourful Christmas Trifle. An International Incident. I was looking forward to this month’s IIP as this month’s theme was very open and there were many ideas running through my head. This month’s theme is COLOUR. I decided to make Christmas trifle. It’s full or colour and my Christmas nowadays is not complete without a trifle of some sort. We’re lucky in Australia to have Christmas in Summer. There are lots of beautiful fruits that are available. 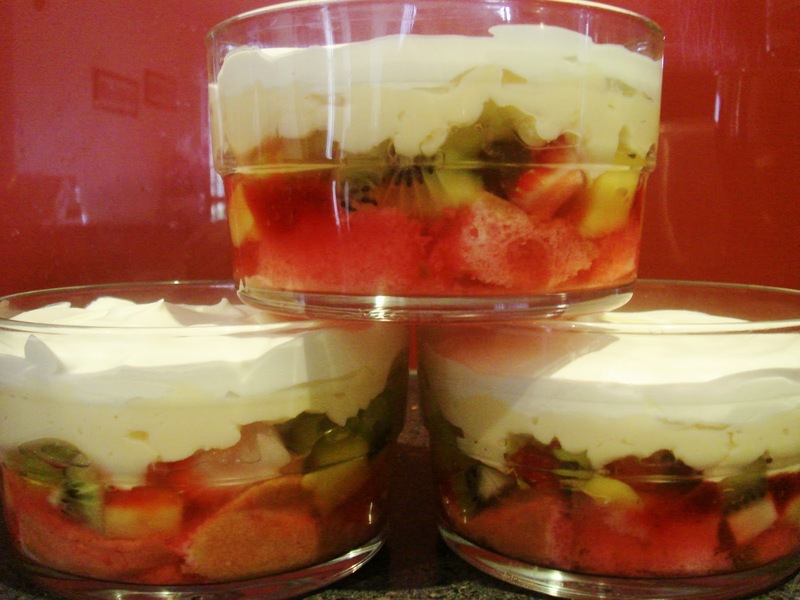 I decided to add strawberries, kiwi and mangoes in my trifle. Not only will it be colourful but also delicious. There are no hard and fast rules on making trifle. 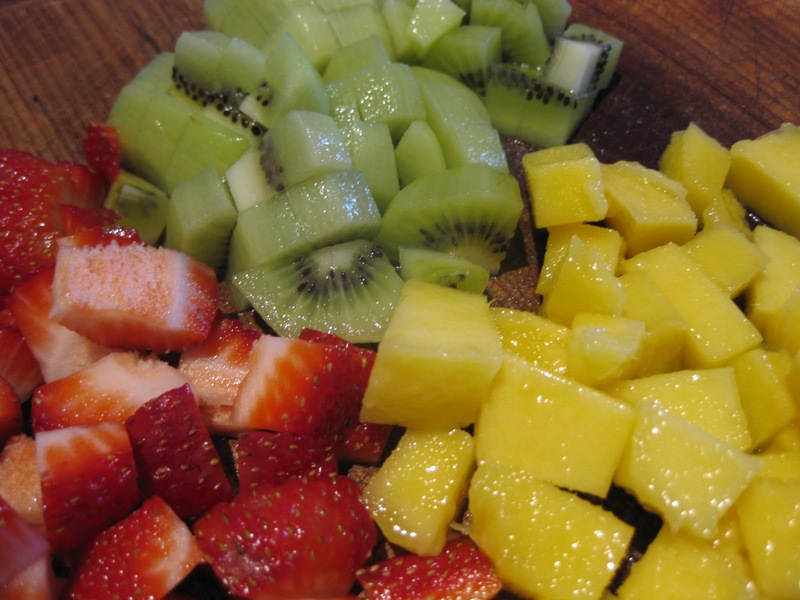 You can add any fruit and as many layers you like. 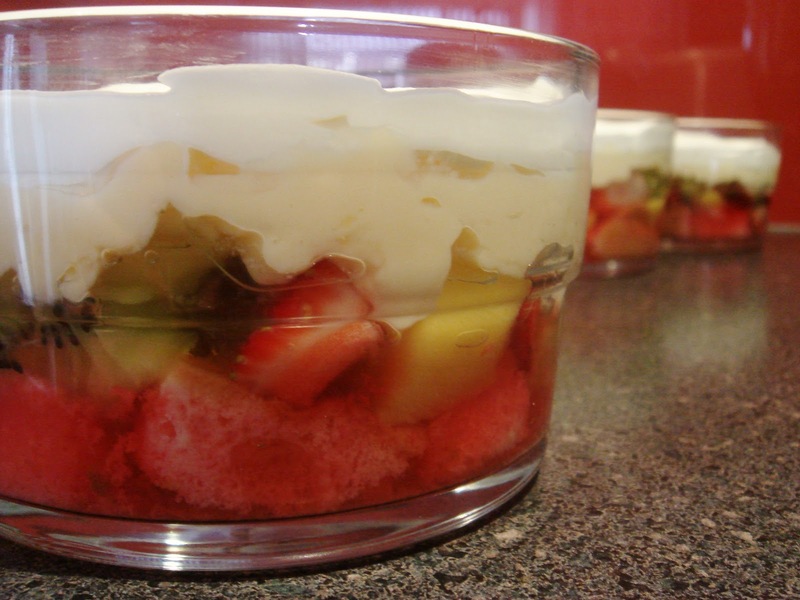 Your trifle can be quick and easy by using store bought cake and custard or you can make it as complicated as you like. You can also make it in a large trifle bowl or make individual ones. There is only one rule when you want to make trifle. You need to be organised. The buttercake needs to be made a day before you want to make the trifle that way it holds up a lot better. You also need to make the jelly before hand so it’s set before using. In my house, my English Hubby is actually a little picky about his trifles and likes the traditional ones. I listened to his “suggestions” and tweaked it a little. My first layer was buttercake that I crumbled a little. I placed the cake pieces in a single layer at the bottom of the bowl. I then made raspberry jelly according to packet instructions (less 50ml water) and poured over the cake. Place the bowls in the fridge for a couple of hours to set the jelly. My second layer is an assortment of fruits. Be as colourful as you can, after all, it is for Christmas. I diced them into smallish pieces and placed them randomly over the cake and jelly layer. 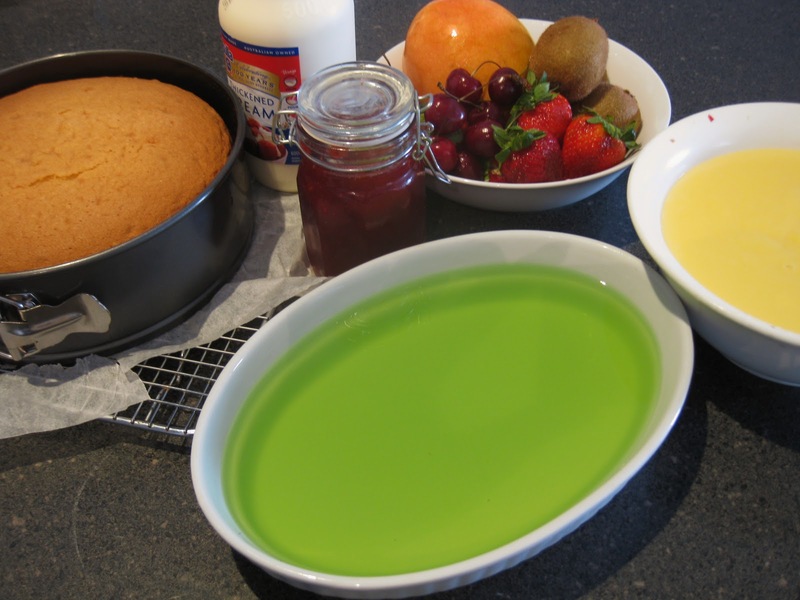 I also pre-made lime flavoured jelly and cut it to the same size pieces and scattered that in as well. For another flavour contrast, I add dollops of my homemade strawberry jam I made earlier in the week. 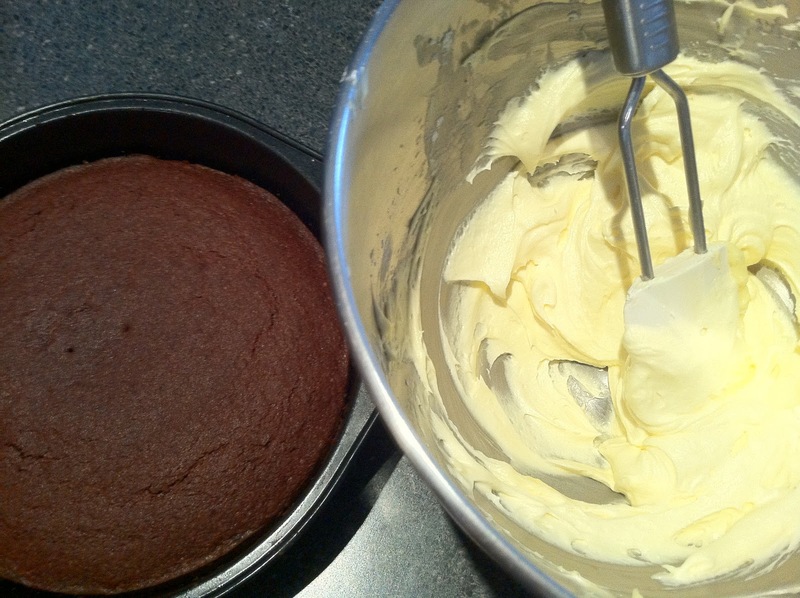 The next layer is a nice thick layer of custard and then topped with whipped cream. 2. Beat butter, vanilla and sugar in a bowl and beat with electric mixer until light and fluffy. Beat in the eggs, one at a time, then stir in flour and milk, in two batches. 3. Spread the mixture into pan and bake for 1 hour. Stand cake in pan for 5 minutes then turn out onto wire rack to cool. 1. Bring the milk and cream to the boil in a non-stick saucepan. Beat the egg yolks, cornflour and sugar together in a bowl, then gradually wisk in the hot milk and cream. 2. Return the mixture to the pan and cook over a low heat, stirring constantly for about 10 minutes. The mixture should be thick enough to coat the back of the spoon. Do not let it boil or it may curdle. 3. Transfer to a bowl and leave to cool. Merry Christmas and Happy Holidays to everyone, especially those who attended the party. Here we are again at another International Incident Party, always happily hosted by Penny of Jeroxie blog. This month’s theme is Salt. Salt is so versatile. 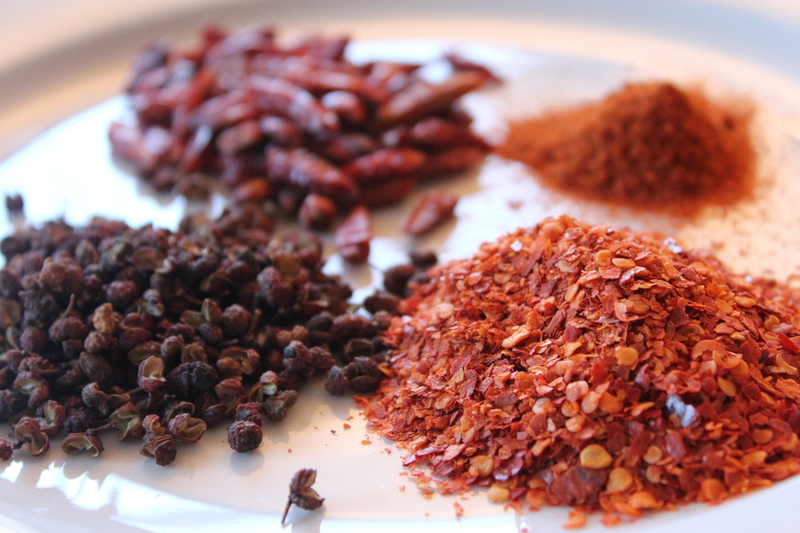 It can be used in savoury as well as sweet dishes. Since salt is an everyday ingredient found in all dishes, it can easily be overlooked as a main ingredient so I’m happy to see that salt is featured as this month’s theme. I’m looking forward to read other party goers take on the theme. For this theme, I’ve decided to make salted dulce de leche. 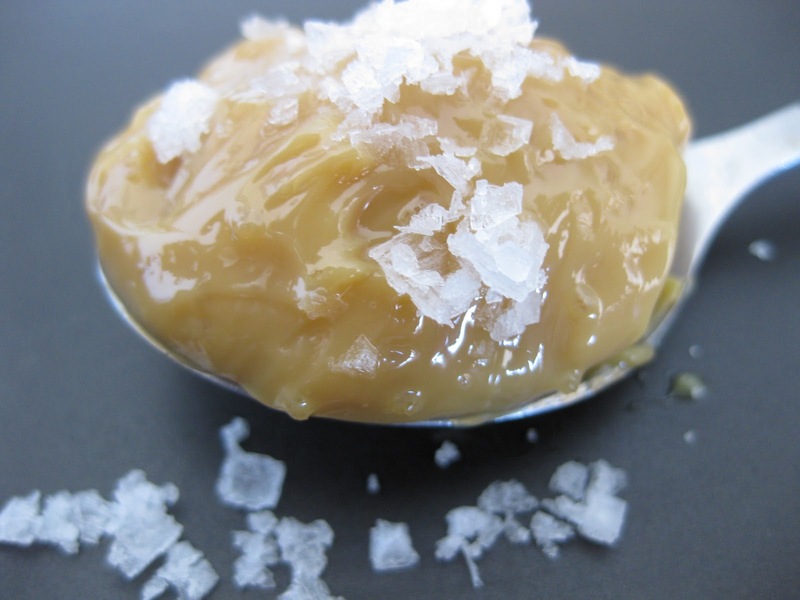 I know that salt goes well with caramel so why not with dulce de leche? I’ve always made my own dulce de leche as it’s very easy and satisfying. When you do make your own, please do be careful and always keep your eyes on it. There can be certain disasters when left unchecked. (i.e explosions in the kitchen!). As it keeps for months, I make it in bulk and keep it in the pantry ready for use anytime. 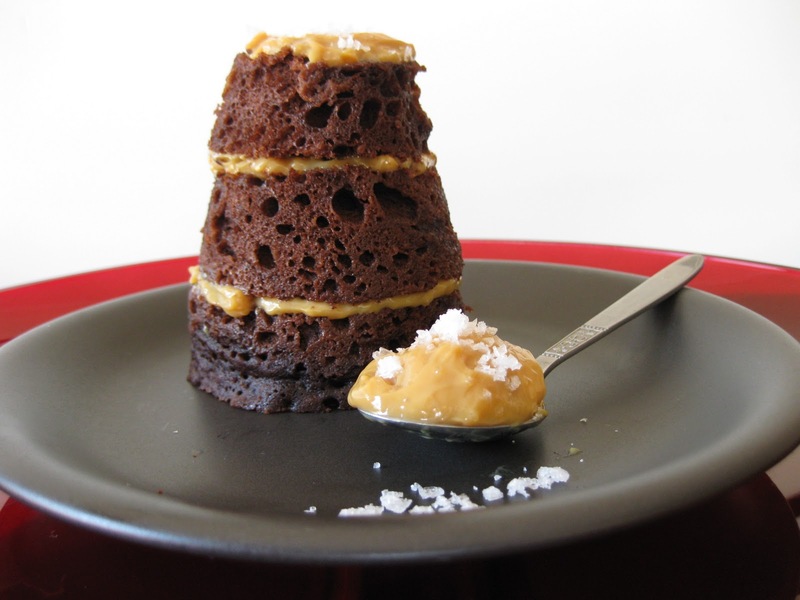 I loved the combination of the chocolate cake, sweet dulce de leche and the sea salt. It definitely made a difference to the flavour and also the texture of the dish. To make the dulce de leche, you can get the recipe here. This has to be made the day before as it takes at least 3 hours to make and has to be totally cooled before using. 1. Add the dry ingredients to large mug and mix well. Once the cake is cooled, carefully remove from the mug and cut into 3 slices. On top of each layer, spread a little of the dulce de leched and add a sprinkle of sea salt. Lay each slice on top of each other. Other people enjoying the salt party. Will you join us for the next party?